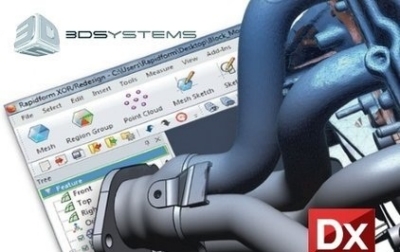 Geomagic Design X (formerly Rapidform XOR), the only 3G (third-generation) reverse engineering software, is a complete software application for creating CAD models from 3D scan data. With Geomagic Design X, you can open data from any 3D scanner and quickly create editable, parametric solid models of virtually any physical object. These models can be transferred from Geomagic Design X into popular CAD applications, including SolidWorks, Siemens NX, Pro/ENGINEER, CATIA V4, CATIA V5 and AutoCAD with complete feature trees intact. This means that - unlike second generation reverse engineering software - the models from Geomagic Design X are editable just like any other part designed in CAD. And XOR can save models as Parasolid, STEP, IGES and STL for use in any CAD/CAM/CAE application. The third-generation parametric reverse engineering approach inside Geomagic Design X makes creating high quality, ready to manufacture CAD models fast and easy. Creating complete solid models accurate to within a few microns of a 3D scan takes less time than redrawing it in CAD. Geomagic Design X, paired with a 3D scanner, is simply the fastest, most accurate way to create a Design model of a real-world object. Geomagic Design X uses proven solid and surface modeling techniques to create CAD models from point clouds and polygon meshes produced by 3D scanners. Unlike the raw data that is created by a 3D scanner, these CAD models are lightweight, made up of editable features, and are directly usable for machining, Design changes, simulations, analysis and much more. And unlike first- or second-generation reverse engineering approaches, the models you create in Geomagic Design X aren't just static NURBS surfaces. They can be manipulated, edited, updated and changed at any time and in any way you define. And every model created in Geomagic Design X is sure to be accurate. The patent-pending Accuracy Analyzer shows real time deviation analysis while you redesign the part, so you can ensure your finished model is faithful to the original 3D scan. And it saves time because you never have to leave Geomagic Design X to check your modeling accuracy. In Geomagic Design X, you're not just capturing the shape of the scanned object, you're capturing its original Design intent as well. XOR automatically detects features, such as revolves, extrusions, sweeps and fillets, on the scanned object. Finished CAD models from Geomagic Design X are "intelligent" - they contain both form and function. Because the models are made up of features extracted from scans, rather than just surfaces that are fit to scan data, they are much cleaner and have defined dimensions and constraints. Depending on the need, you may want your reverse engineered models to match the exact geometry of the real world part, including all of its imperfections. But more often than not, a pristine, idealized CAD model that represents the original Design intent of the part is preferred. Geomagic Design X is the only reverse engineering software that extracts Design intent as CAD features. CAD models are the industry standard for communicating Design parameters and manufacturing requirements. Once the 3D scan data of a part has been modeled in Geomagic Design X, a fully parametric solid model with modeling history can be exported through XOR's patent-pending liveTransfer and modified in SolidWorks, Siemens NX?, Pro/ENGINEER, CATIA V4, CATIA V5 and AutoCAD?. Other 3D applications can open models created in Geomagic Design X using industry-standard formats like Parasolid, STEP and IGES. Geomagic Design X takes an elegantly simple approach to reverse engineering: redesign an object the same way it was originally designed. Because XOR uses 3D scan data as a template on which to build a CAD model, rather than converting the scan data into a NURBS surface model, you don't need to spend much time cleaning or editing the point cloud or polygon mesh itself. Traditional first- and second-generation reverse engineering approaches require a perfected mesh, which can sometimes take hours to refine. With Geomagic Design X, you skip directly to making the CAD model. Benchmark tests have shown that Geomagic Design X's third-generation approach cuts complex reverse engineering jobs from days to hours. A new out-of-core massive point cloud engine of Geomagic Design X handles 10x more data with real-time rendering of billions of point cloud. Thus, Geomagic Design X is also a right software solution for huge size of scan data generated by long range 3D scanners as well. Thanks to Geomagic Design X's powerful geometric feature extraction functionality, engineering-grade as-built CAD models can be easily created from huge size of scan data.